Whether in a warehouse, at a desk, in a vehicle or on foot, the right accessories and mobile tablet can dramatically increase productivity and ensure uninterrupted workflow. What accessories work best with mobile tablets? With new options for an integrated UHF RFID reader or Smart Card reader, the Winmate M101B automates work efficiencies enabling users to increase work productivity, reduce cost associated with inventory or handling delays, and streamline the work process. UHF-RFID features longer read ranges (1.5 m to 3 m) and increased reading speeds, allowing users to tag and automatically track large quantities of assets from a greater distance. An optional smart card reader is capable of reading Smart Cards compliant with ISO7816-1,2,3 and T=0, T=1 protocols. The UHF RFID or smart card reader attached as a snap on to the rear side of the expansion port allowing users to customize and expand the M101B to specific needs. 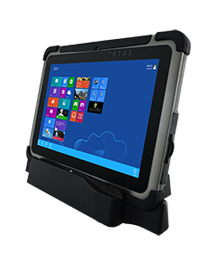 Tablet PCs like the M101B are often deployed in applications where the user must alternate between in-office and in-the-field scenarios. To streamline productivity between various applications, Winmate offers desk docks, vehicle docks, and VESA mount kits. This means no matter where and how the M101B is deployed, we have the accessories to get the job done. 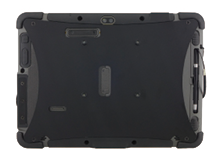 The standard hot-swappable Li-Polymer battery packs 39.2 watt-hours, ideal for users who need 10-12 hours of operation. Winmate, however, offers an optional long-life high, capacity-battery with twice that capacity at 78 watt-hours. For workers who require more power, Winmate's dual-bay spare battery charger allows two batteries to be charged at the same time, ensuring uninterrupted workflow. 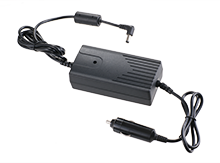 For users who don’t need to rely solely on the battery, Winmate’s vehicle charger allows a second option for power supply. 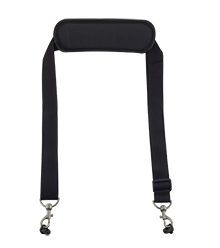 When in the field or on foot, Winmate's hand straps, carry bags and shoulder straps allow users to carry the M101B Tablet with safety, convenience, and comfort..
M101B's processing power comes from Intel's next-generation Bay Trail 1.83GHz quad-core N2930 processor paired with genuine Intel graphics for high performance with low-power impact. 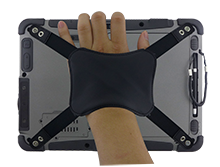 The tablet features a brilliant, in-plane switching, projective capacitive touch screen, which is outdoor viewable and offers 1920 x 1200 pixel resolution. Weighing at just 2.6 pounds (approx. 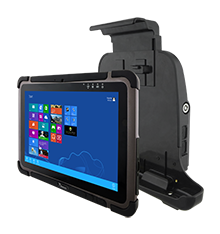 1200 grams) the M101B delivers lightweight mobility in a rugged tablet. It is also equipped with a hot-swappable battery for uninterrupted operation, and features robust data capture with 2.0MP front camera for conferencing and 5.0MP rear camera for additional data capture.